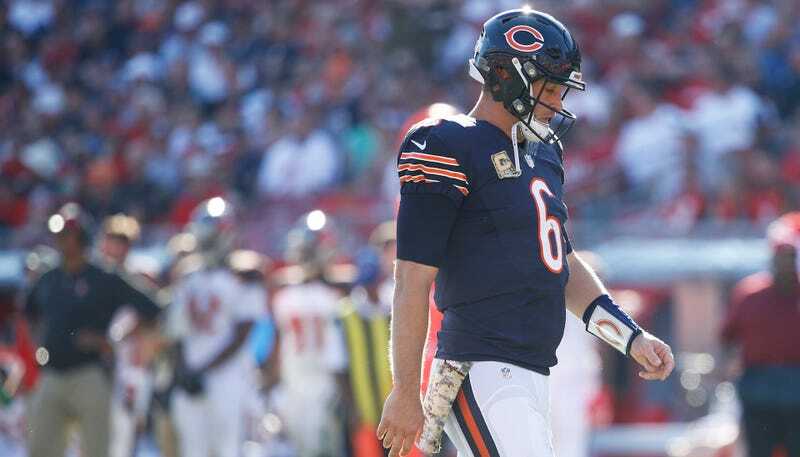 As Barry wrote a month ago, Jay Cutler is highly unlikely to return to the Chicago Bears next year. He’s 33 years old and the Bears have to pay him $16 million dollars if they keep him next year, which would be an outrageous amount to pay the disgruntled sort-of-good quarterback of a 2-8 team in full-on rebuild mode. It seemed as if he was going to ride out the rest of Chicago’s sad-sack season and find his way to some team closer to contention in need of a quarterback who can still sling it. Unfortunately, he won’t even have the privilege of an exit on his terms, as he will reportedly be out for the rest of the season with a torn labrum. This news came on the same day that the team’s leading tackler Jerrell Freeman caught a four-game suspension. If you must know, the Bears will proceed ahead on driving their season straight into an iceberg with Matt Barkley at the helm. Cutler has played eight seasons in Chicago and has stacked up a rather fitting 52-52 record. He accrued a bunch of Bears franchise records, such as touchdown passes, completions, and pass attempts. If he does leave, his last pass for the team was picked off by Landon Collins for a game-sealing interception. Congratulations in advance to the Jets on their new quarterback.